More than 50 years have passed since the moment when humanity discovered a uniform flow of low-energy microwave radiation emanating from all parts of the sky. It does not come from the Earth, not from the Sun, or even from the Galaxy; it comes from places that are beyond the limits of any star or galaxy that we have ever seen. And although his pioneers did not know at first what it meant, a group of physicists, located near them, was already developing an experiment to search for this particular feature: the theoretical residual glow of the Big Bang. astronomical satellite Plank European Space Agency , launched in 2009. A full set of data was collected by the satellite for several years, and the scientists have just finished and have published its final analysis. And that's how he forever changed our idea of ​​the universe. The residual luminescence from the Big Bang, RI, is not homogeneous, and has many tiny imperfections and temperature fluctuations in the interval of several hundred micro-Kelvin. And although this plays a big role in the period after the gravitational growth, it is important to remember that in the early Universe, as well as the large-scale Universe of our days, the inhomogeneities reach values ​​of only ???%. 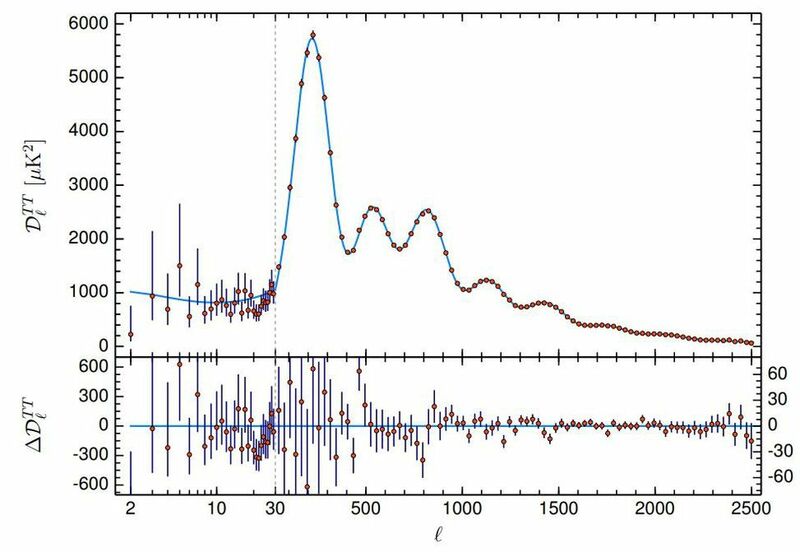 Planck discovered and measured these fluctuations with an accuracy inaccessible earlier. satellite COBE gave us the first approach to it, a map of the RI for the entire sky with a resolution of about 7 degrees. About 10 years ago WMAP could increase the resolution to half a degree. And what about Planck? Planck is so sensitive that its limitations are caused not by tools that can work with a resolution of up to ??? °, but by the fundamental astrophysics of the universe itself! In other words, at this stage in the development of the universe, it is impossible to get an image better than Planck's. Increasing the resolution will not give you more information about the space. COBE, the first RI satellite, measured fluctuations with a resolution of 7º. 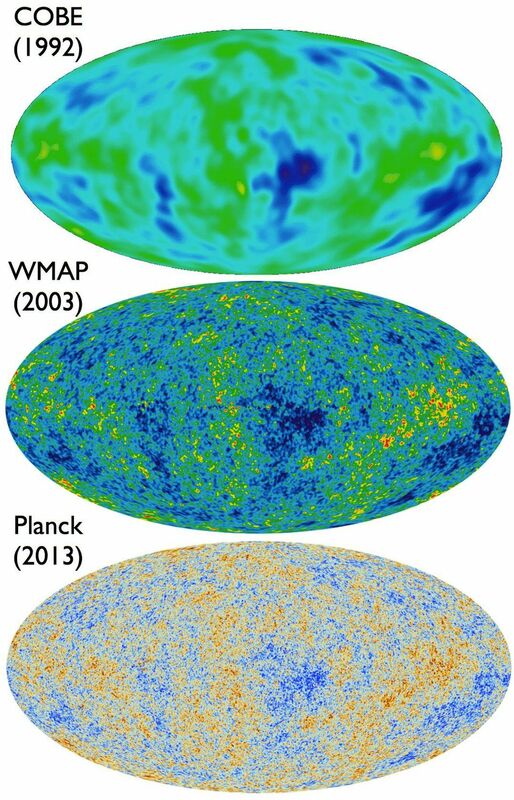 WMAP managed to improve the resolution to 0.3 ° in five different frequency bands, and Planck measured with an accuracy of up to 5 minutes of angle (??? °) over nine different frequency bands. 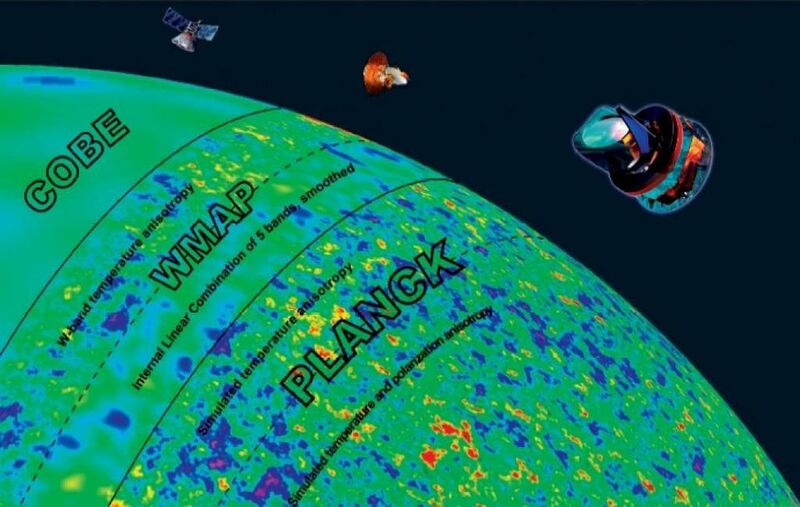 Planck also managed to measure this radiation and its fluctuations in more frequency ranges (in total, nine) than any other of the previous satellites. COBE had four ranges (and only three useful ones), and WMAP had five bands. COBE could measure temperature fluctuations reaching 70 μK; Planck was able to improve the accuracy to 5 μK. High resolution, the ability to measure the polarization of this light, and different frequency ranges helped us understand, measure and subtract the effects produced by dust in our Galaxy better than ever before. 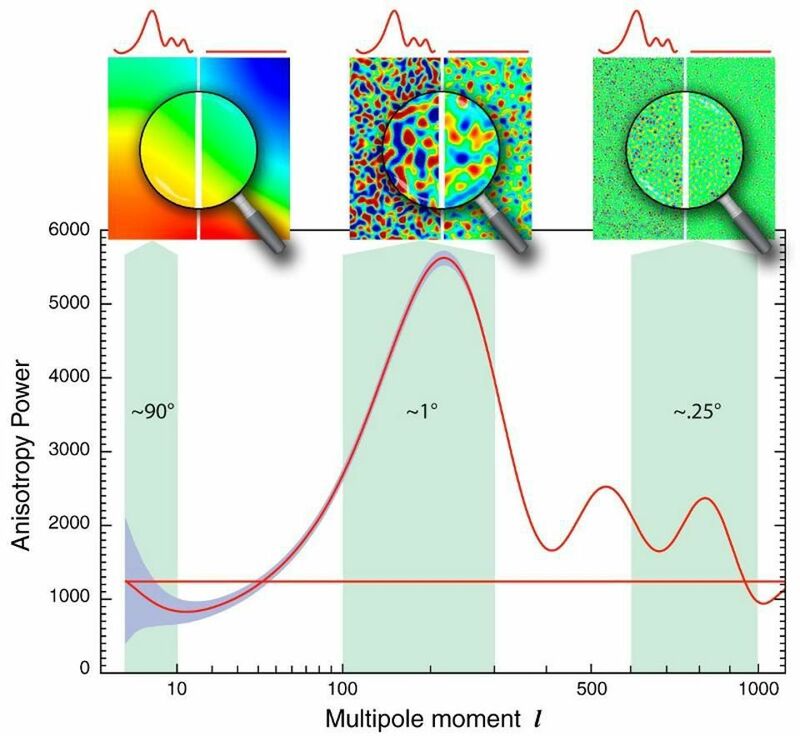 To understand the residual luminescence of the Big Bang, it is necessary to study not less accurately the effects that can contaminate the desired signal. This step had to be taken before extracting any cosmological information. 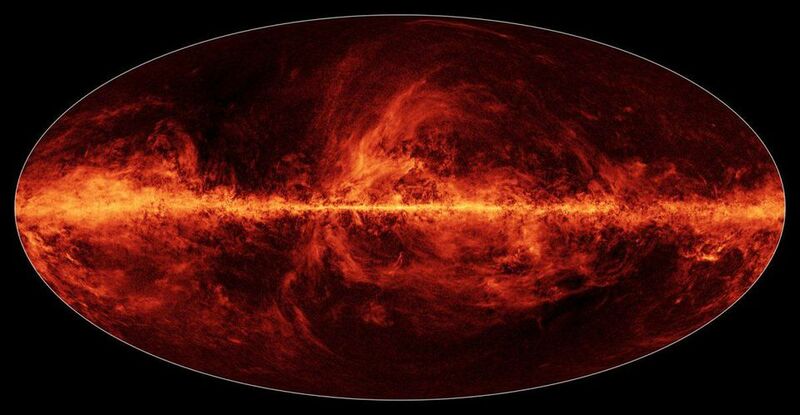 The full dust map of the Milky Way, obtained by Planck, shows a two-dimensional map of dust distribution in the Galaxy in low resolution. This "noise" must be subtracted to recreate our background prehistoric cosmic signal. what is the shape and curvature of the universe. The temperature at hot and cold points, and also their scales, speak about curvature of the Universe. The best of our measurements give us a flat universe. 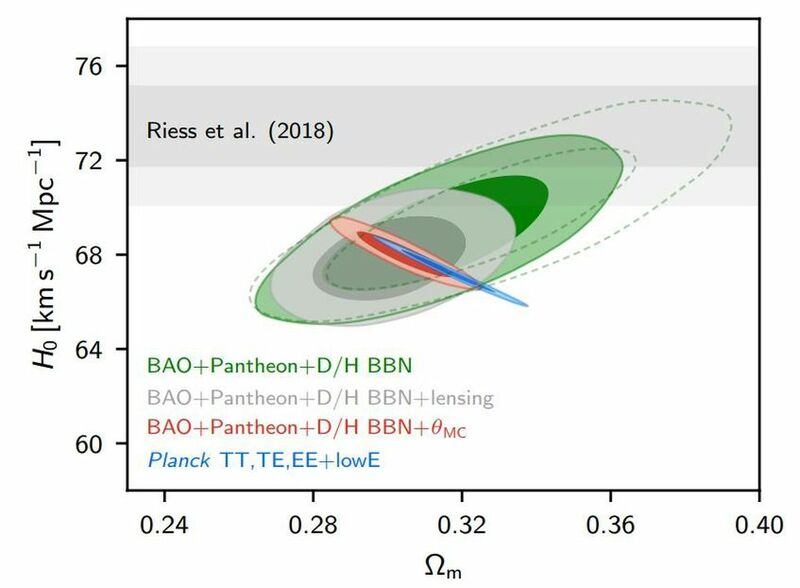 Baryon acoustic oscillations and RI jointly provide the best methods for limiting the error of this measurement by 0.1%. and much more. Although our RI temperature is still at ??? K, values ​​that have been known to us for several decades have changed much more. Given all this, that's how Planck forever changed our view of the universe. 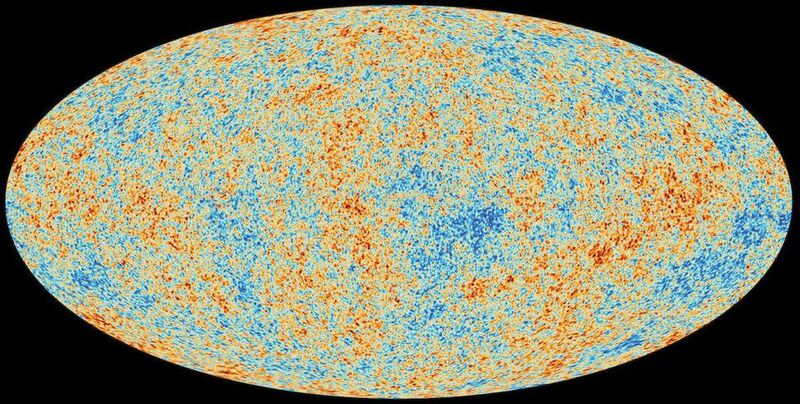 The data of the Planck satellite, together with additional data sets, gave us very strict limitations on the possible values ​​of the cosmological parameters. In particular, the Hubble expansion rate is located in the range from 67 to 68 km /s /Mpc. In the universe was more matter, and its speed of expansion was less than we thought. Before Planck, we believed that the universe was 26% of matter and 74% of dark energy, and the expansion rate was about 70 km /s /Mpc. In the universe was 31.5% of matter (of which 4.9% is normal, and the rest is dark), 68.5% of dark energy, and the expansion rate is 67.4 km /s /Mpc. And the speed of such a small error (~ 1%), that it comes into conflict with by measurement of , made on the basis of space ladder of distances , from which a speed of 73 km /s /Mpc is obtained. This, perhaps, is the greatest contradiction of all that pertains to the modern view of the universe. Adjustment of the number of neutrino species necessary to fit the data on RI fluctuations. These data correspond to a neutrino background with a temperature that is energetically equivalent to ??? K, which is much less than for RI photons. The latest results from Planck also definitely point to only three types of light neutrinos. From Planck, we learned that neutrinos are only three types, and that the mass of each species can not exceed 0.4 eV /c 2 : this is 10 million times less than the electron. We know that the cosmic temperature of these neutrinos corresponds to 72% of the temperature /kinetic energy of RI photons; if they did not have mass, then today their temperature would be 2 K.
We also know that the universe is very, very flat in terms of overall spatial curvature. 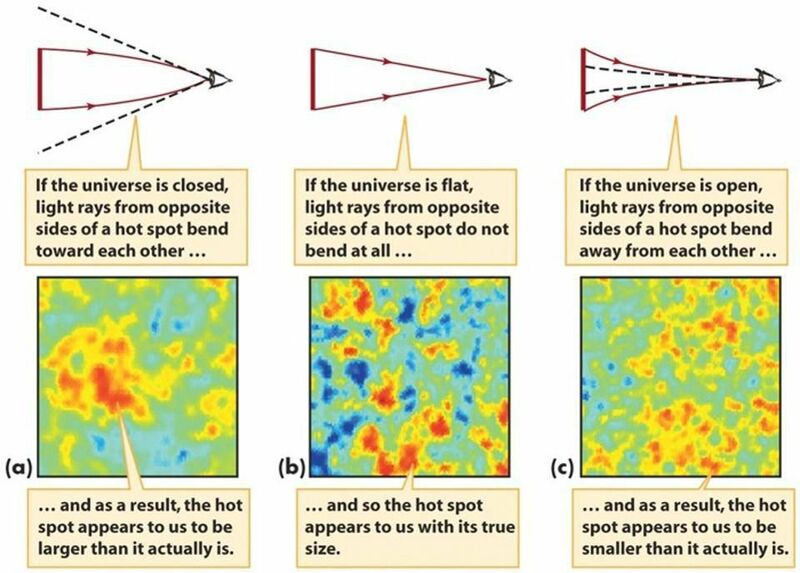 By combining data from Planck with data on the formation of large-scale structures, we can establish that the curvature of the universe does not exceed 1/100? that is, the universe is indistinguishable from ideally flat. RI fluctuations are based on the primary fluctuations produced by inflation. In particular, the flat part of the chart on a large scale (left) can not be explained without inflation. A straight line denotes seeds, from which the pattern of dips and peaks will appear over the first 38?000 years of the universe, assuming that n s = 1. The real data spectrum from the Planck gives a small but important deviation: n s = ???r3r3280. We also have the best confirmation for today that density fluctuations ideally coincide with the predictions of the theory of cosmic inflation. The simplest models of inflation predict that the fluctuations with which the universe was born were the same on all scales, and on larger scales they were slightly stronger than on small ones. For Planck this means that one of the quantities that it can derive is n s , should be almost ? but be slightly less than this. The measurements of Planck became the most accurate of all, and perfectly confirmed the inflation: n s = ???? with an error of less than ???%. [i] In themselves, the data from Planck do not give very strict restrictions on the equation of state of dark energy. But if we combine them with a complete set of data on large-scale structures and supernovae, we can definitely demonstrate that dark energy fits very well within the framework of a pure cosmological constant (the intersection of two dashed lines). And there is the question of whether the dark energy is really a cosmological constant, and it is very sensitive to both RI and to the data on the farthest corners of the Universe - for example, over supernovae type Ia. If the dark energy is an ideal cosmological constant, then its equation of state, given by the parameter w, must be exactly -1. We found that w = -1.0? with an error of ???. Evidence for other options is not observed, that is, Large compression and Large gap these data do not support. Our best measurements of the ratio of the amount of dark matter, normal matter and dark energy in the universe today, and how they changed in 2013: to Planck and after the release of the first Planck data. 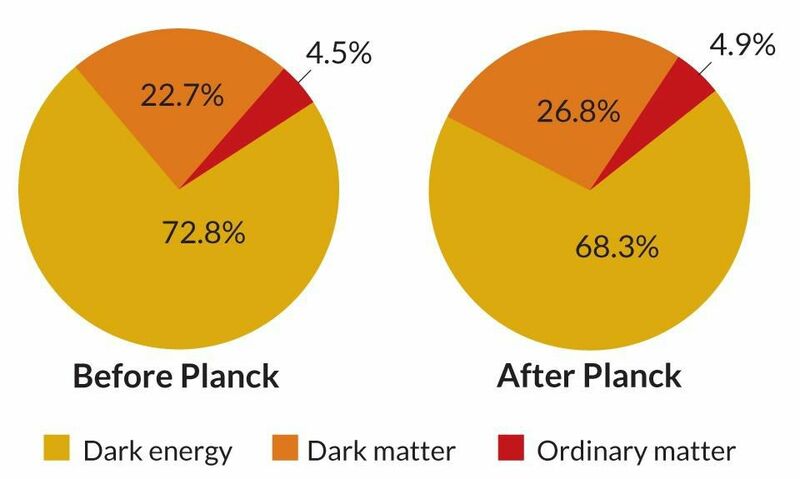 The final result obtained from Planck is no more than 0.2% different from the first. A little changed and other meanings. The universe is slightly older (13.8 instead of 13.7 billion years) than we previously thought; the distance to the edge of the observed universe is slightly less (46.1 instead of 46.5 billion light-years) than WMAP showed; restrictions on the magnitude of the gravitational wave created by inflation have improved slightly. The parameter of the tensor-scalar relation, r, to Planck was bounded from above by a value of 0.3. 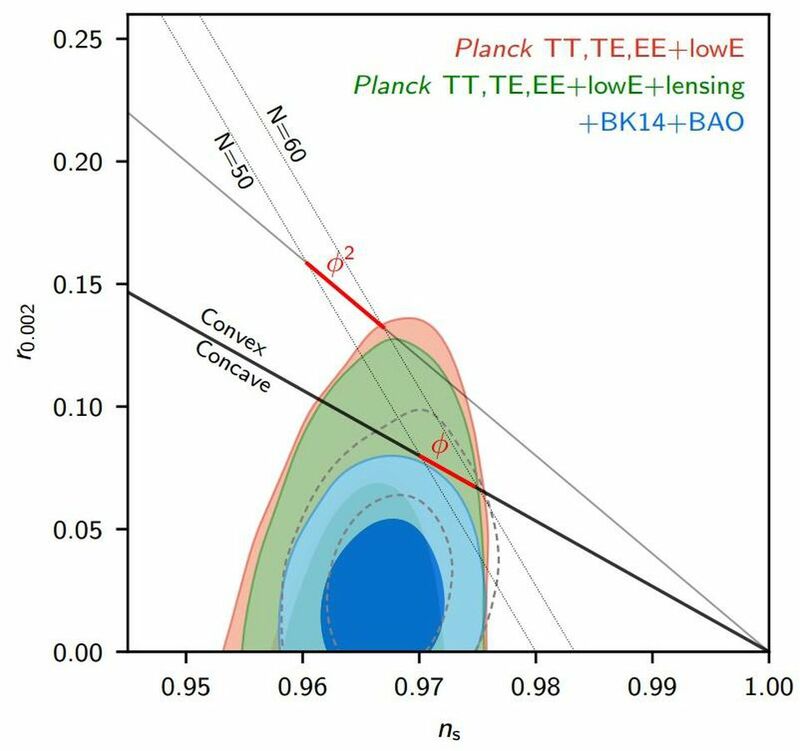 Now, with data from Planck, on large-scale structures and other experiments (for example, BICEP2 and Keck array), we can confidently state that r < 0,07. Это исключает несколько моделей инфляции, считавшихся возможными ранее. Vertically, the ratio of the tensor to the scalar ®, horizontally - the scalar spectral index (n S ), Determined by Planck and data on supernovae and large-scale structures. Note that if n s is well limited, then you can not say that about r. It is likely that r will be extremely small (down to ??? or even less). Planck's limitations, even the best available, are still not good enough. And now, with all this data, what ideas about the Universe and its components can we say "yes" and which "no"? Yes - inflation, no - to the gravitational waves after it. Yes - three ultra-light neutrinos of the standard model, no - extensions. Yes - to a slightly slower expansion, the older universe, no - to any evidence of spatial curvature. Yes - a little more dark matter and normal matter, yes - a little less dark energy. No - changing dark energy, Big tear and Big contraction. 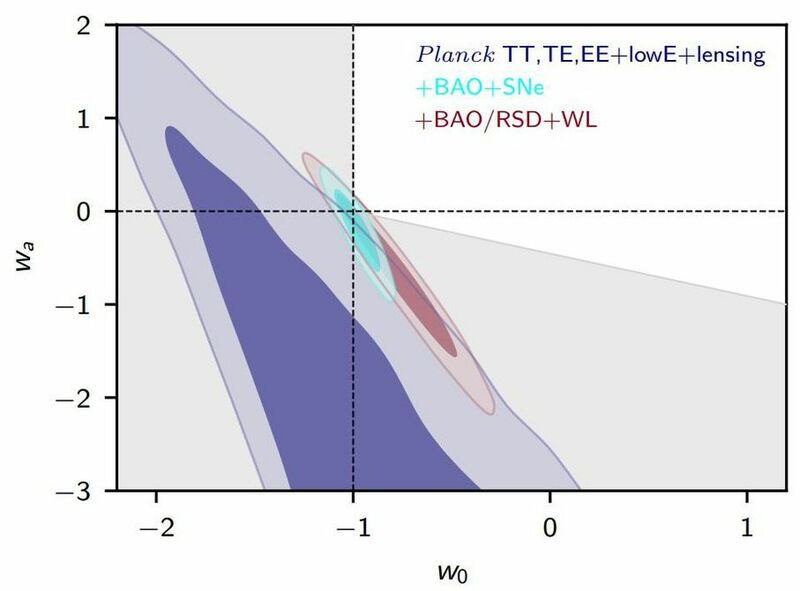 The final results of the work of the Planck collaboration demonstrate an extremely accurate coincidence of the predictions of cosmology with an abundance of dark energy and dark matter (blue line) with data (red dots and black errors). 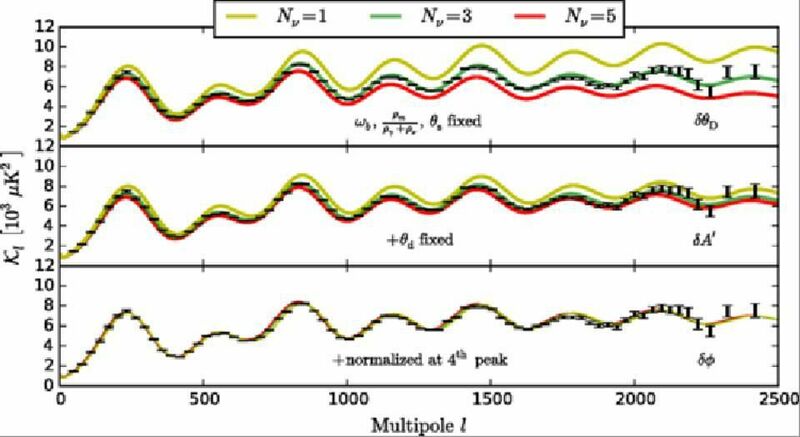 All 7 acoustic peaks perfectly match the data. Most importantly, there is tremendous consistency with the unprecedented accuracy between the observed RI and the theoretical predictions of the behavior of the universe with 5% of normal matter, 27% of dark matter and 68% of dark energy. Some of these values ​​can fluctuate within 1-2%, but the universe without large amounts of dark matter and dark energy can not exist. They are real, they are necessary, and their predictions are ideally suited to the entire data set. Inflation, neutrino physics and the Big Bang have received additional confirmations, and alternatives and special options have become more limited. Certainly, as the Collaboration Planck writes, "We have not found convincing evidence of the need to expand the basic lambda-CDM model ". Finally, we can state with absolute certainty what the universe is made of. 12/06/2018 Recovered data from the mission "Apollo" helped solve the riddle of "heating the moon"
03/06/2018 Ask Ethan: if dark matter is everywhere, why did not we find it in the solar system?